Anna Meriano grew up in Houston, Texas, with an older brother and a younger brother but (tragically) no sisters. 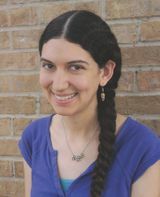 She graduated from Rice University with a degree in English and earned her MFA in creative writing with an emphasis in writing for children from the New School in New York. She has taught creative writing and high school English and works as a writing tutor. Anna likes reading, knitting, playing full-contact quidditch, and translating English song lyrics into Spanish and vice-versa. Her favorite baked goods are the kind that don’t fly away before you eat them.